Dr. Cherisse Du Preez is a postdoctoral scholar at Pennsylvania State University working in Dr. Charles Fisher’s laboratory. Cherisse is studying the ecology of the hydrothermal vents in the Lau Basin, Pacific Ocean (due north of Tonga). She uses two- and three-dimensional imaging to study the fine-scale spatial distribution of vent animals in response to physical and chemical environmental conditions. Cherisse graduated from the University of Victoria (Canada) in 2015 with a PhD in biology, specializing in deep-sea spatial ecology under the supervision of Dr. Verena Tunnicliffe. She has since completed an Natural Sciences and Engineering Research Council (NSERC) visiting fellowship at Fisheries and Oceans Canada (DFO) with Dr. Janelle Curtis. 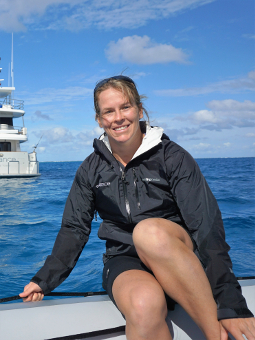 Her research interests and publications cover a range of deep-sea environments, including seamounts, deep-sea coral and sponge gardens, and fjords.